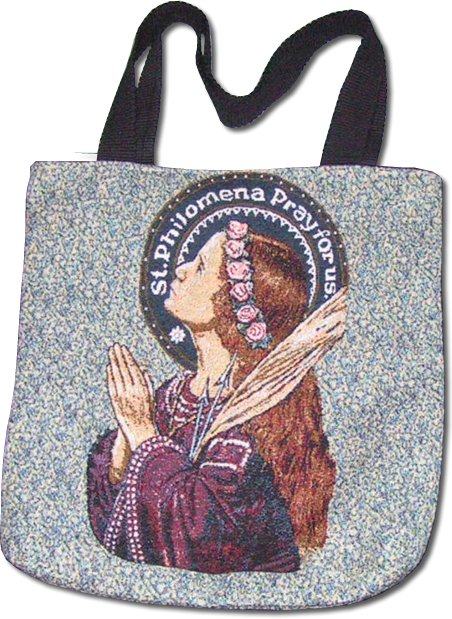 This medium weight tapestry tote bag is well made and very durable and is uniquely made in the U.S.A.. It can carry a heavy load with broad straps which make it comfortable to carry around. The design of the tapestry picture originates from the depiction of St Philomena in Ireland which spread across to the UK and thus igniting the devotion in that area of the world. It has now spread worldwide and is a much loved picture in the USA and Canada. Matching throw cover and wall hanging available. This item would be a great gift!